The seismic waves ringing out from Nepal on April 25 reached sensors around the planet, mobilizing a vast, remote response that’s truly a sign of the times in modern seismic disaster recovery. While Kathmandu and the surrounding towns and villages stood shocked and crippled by the now-named Gorkha earthquake, satellites sweeping by overhead quickly gathered a picture of the scene, transmitting intricate detail of the disaster to the world with unprecedented speed. Through a combination of mandates, directives, an activation of the International Charter for Space and Major Disasters, and humanitarian good will, government agencies and private satellite companies began releasing data from the region to allow response teams, aid workers, and researchers to piece together what happened in the earthquake and take quick, informed action. While crucial on-the-ground relief efforts are first on the scene, they often struggle with logistics in a potentially foreign land that’s been battered by violent shaking. Power failures, rubble, landslides, severed roads, foreign territory, and an unfamiliar spread of urban and rural resources (basic unknowns like where to get supplies, or how to get to a hospital), hinder relief workers in the aftermath of a major disaster. Thanks to satellites and an ambitious contingent of remote, digital responders, these unknowns have been or are being mapped, modeled, and predicted with astounding detail in an impressively and critically short amount of time. NASA, for example, released a map showing where their Suomi satellite detected a decline in electricity usage following the quake, highlighting areas without power. 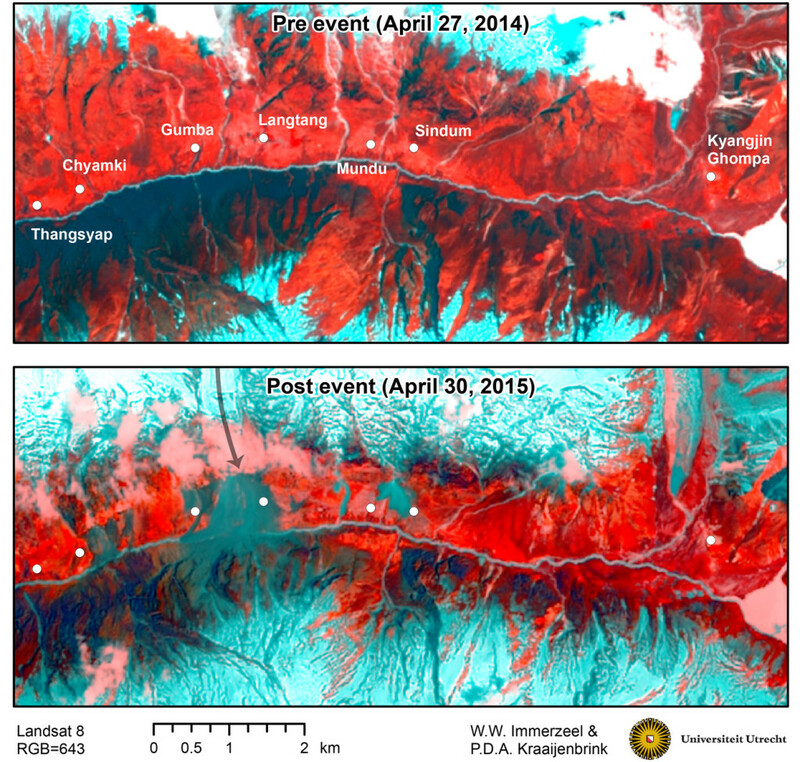 NASA Visual Infrared Imaging Radiometer Suite detects changes in emittance of electrical light in Nepal. Image from NASA Earth Observatory. Radar images from COSMO-Skymed were used to detect damage to structures, generating a map of where help might be needed most. Other radar satellites, like Sentinel-1, have given scientists a wide view of the ground deformation caused by this earthquake, which warped the Lesser Himalaya upwards by ~1 meter while dropping down the high peaks. Other radar satellites have provided additional constraint on this ground deformation. The pattern of this deformation reveals which portion of the subterranean thrusts beneath the Himalayas ruptured and slipped to produce this earthquake, an indispensable bit of knowledge for understanding the architecture of this mountain range and the potential for further earthquakes. Importantly, the gentle continuous warp of the ground revealed by these radar interferograms indicates that slip along the Main Boundary Thrust did not reach the Earth’s surface, leaving huge expanses of the plate boundary locked and primed for further large earthquakes. Meanwhile, though hindered by a streak of cloudy days post-earthquake, high resolution optical satellite companies released as much data as they could covering the region. Pre-event imagery provided basemaps upon which volunteers digitized roads, structures, schools, hospitals, and other infrastructure. The National Polar Geospatial Center took pre-event stereo imagery from the National Geospatial-Intelligence Agency archive license and generated a high resolution digital elevation model of Kathmandu Valley. Imagery and cloud coverage has not *yet* enabled a post-event DEM. Post-event imagery, gradually obtained through breaks in the clouds, provided the basis for a huge crowd-sourced damage mapping campaign enabled by DigitalGlobe through their Tomnod program. The result is an extremely rapidly produced map of remotely sensed earthquake effects, now available here. Satellite images have also enabled identification and mapping of coseismic landslides, the foremost secondary hazard associated with this earthquake in its rugged mountainous setting. In particular, Landsat8 provided the earliest clear picture of massive landslides in Langtang Valley and elsewhere in the Nepalese Himalaya, areas that have been difficult to reach on the ground due in part to the landslides themselves. Landsat 8 false-color (highlighting infrared radiation from vegetation) image of Langtang Valley revealing devastating landslides induced by the violent earthquake, constructed and annotated by Walter Immerzeel and Philip Kraaijenbrink at Utrecht University. This remote, digital response is a big deal. It’s fundamentally enabled by the impressive resolution and scope of current satellite sensors; it’s executed by teams of enthusiastic geographers, geodesists, and geoscientists, professional and amateur alike; and its end products are maps of what happened in the earthquake (damage, landslides, the extent of ground deformation) as well as forecasts of what risks remain, where attention should be focused, and guidance for recovery. Much has been made of this remote rapid response. Wired was very excited about it in an article shortly after the event. The team at OpenStreetMap is impressed by and proud of the participation they had. Naturally it’s exciting and fulfilling stuff to be involved in. In addition to the hyperlinks peppered throughout this post, below are a few hubs at which these products are being collected, distributed, and coordinated. Have a look at the wide array of products that come from these data, and efforts underway to collect and use more.